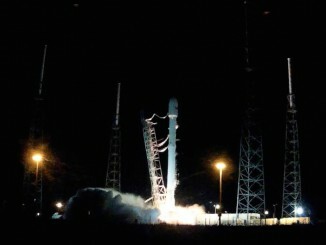 Elon Musk, SpaceX’s founder and chief executive, said Thursday the next Falcon 9 launch is coming soon. Industry officials have said the next Falcon 9 flight — the first since a June 28 launch failure — is expected in mid-November, with some sources saying the mission could launch no earlier than Nov. 17. SpaceX officials have not disclosed a specific target launch date. Engineers are completing inspections on brackets inside already-built Falcon 9 upper stages to ensure the components are not susceptible to the same deficiency SpaceX blames for the June 28 launch failure, which destroyed a commercial supply ship bound for the International Space Station. 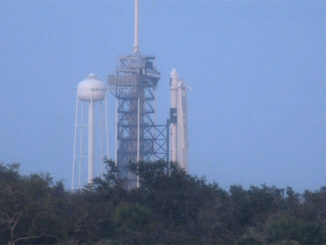 The structural braces were provided to SpaceX by a supplier, and data reviews from the June flight indicated one of the brackets holding a helium pressurant tank failed, causing the high-pressure gas tank to break free inside the second stage liquid oxygen tank, leading to the stage’s rupture. SpaceX officials said they would inspect and test such parts in the future, and not trust design specifications provided by subcontractors. 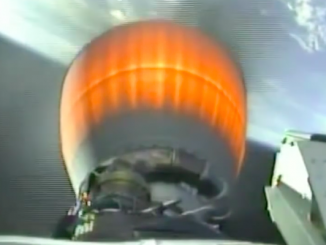 The company was already shifting to a new version of the Falcon 9 rocket later this year, featuring engines rated for higher thrust levels, chilled kerosene fuel, and several other changes aimed at increasing the booster’s performance. 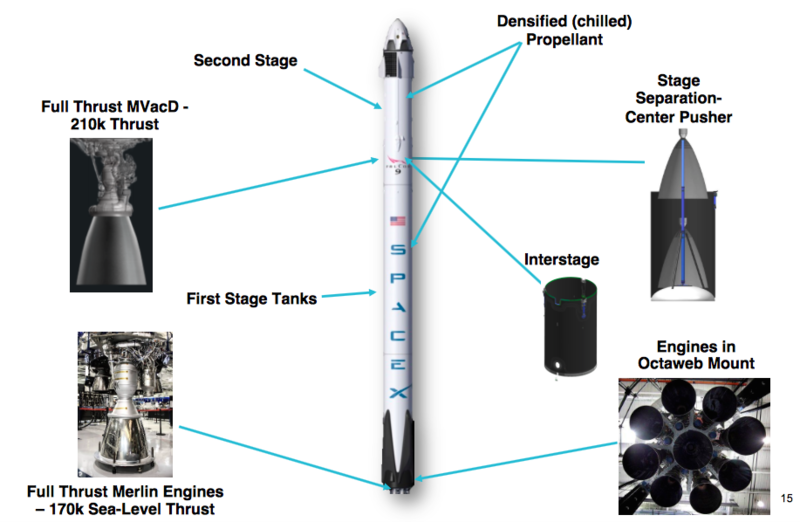 The rocket’s nine Merlin 1D engines will generate more power on the upgraded Falcon 9, topping out at more than 1.5 million pounds of thrust at sea level. Each of the first stage engines will provide 170,000 pounds of sea level thrust. The upgrades allow the Falcon 9 to lift heavier communications satellites into geostationary transfer orbit, and still have enough reserve propellant to attempt recovery on an ocean-going landing platform in the Atlantic Ocean. Earlier missions with payloads going to such orbits flew in expendable mode and did not try for barge landings. SpaceX hopes to demonstrate reusability on the Falcon 9 first stage, an achievement Musk says will drastically lower the costs of space launches. The company has not nailed a landing yet, but several of the vertical descents have come close. The last landing attempt after an April liftoff hit its target, but a command lag to an engine throttle valve caused the 14-story booster to land with lateral velocity, and the rocket tipped over and exploded on the barge. SpaceX is expected to follow the SES 9 launch in November with a Falcon 9 launch in December from Vandenberg Air Force Base in California. It will be the last flight of the previous Falcon 9 v1.1 configuration with throttled-back engines, carrying up the joint U.S.-French Jason 3 oceanography satellite, which was delivered from France to the California launch base in June for a planned liftoff in August. Engineers with Thales Alenia Space, Jason 3’s manufacturer, suspended launch preparations after the June 28 launch failure. A NASA spokesperson said the mission is expected to launch in December, but a target launch date is not confirmed yet on the U.S. Air Force-run range calendar. SpaceX’s next cargo resupply mission to the International Space Station is tentatively set for Jan. 3, according to a NASA source. A logistics launch with Orbital ATK’s Cygnus cargo craft is scheduled for Dec. 3 on an Atlas 5 rocket, and is expected to take priority in the space station’s busy visiting vehicle manifest. Also on tap after the Falcon 9’s return to flight is the launch of 11 Orbcomm data relay satellites — the second of a pair of SpaceX launches to deploy Orbcomm’s second-generation network in low Earth orbit. Orbcomm chief executive Marc Eisenberg said Wednesday he expects his company’s satellites to be third in line for launch on the upgraded full-thrust Falcon 9.